NASA is currently working on designing new equipment for their Asteroid Redirect Mission (ARM), including (for the first time since 1981) a new spacesuit. Due to mission mass limitations, it is not possible to launch both a pressure suit and a space suit for each astronaut. Consequently, NASA is adapting an existing pressure suit called the Modified Advanced Crew Escape Suit (MACES) so that it can also function as a space suit. The astronauts wear the basic pressure suit during launch and landing. For EVA, a Portable Life Support System (PLSS) is attached to the astronaut’s back, and a lightweight thermal management garment is donned over the pressure suit. Astronauts wearing the MACES will be capable of performing short-duration EVAs that last about four hours. 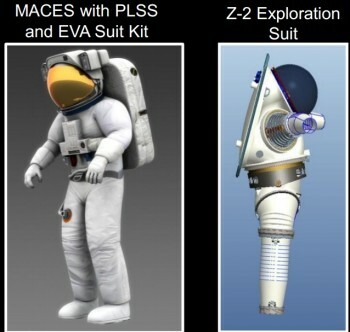 The PLSS is the first new space suit system developed by NASA since the Shuttle Extravehicular Mobility Unit was introduced in 1981. The PLSS uses new several technology components such as a regenerative rapid cycle amine unit for carbon dioxide removal, a suit water membrane evaporator for thermal control, a variable oxygen pressure regulator, and lithium ion batteries for energy storage. The PLSS has been tested with a human metabolic simulator and a mockup space suit, and vacuum chamber tests with a human will begin in 2015. Suchinow silently slipped into the costume and allowed Korf to screw on the helmet with the oxygen chambers. Then he placed himself in the center of the chamber. In one of his leather-covered hands Korf placed a burning candle. Then he closed the door, through the glass window of which all the proceedings could be witnessed. They could clearly hear an electric bell in the chamber, which Korf switched on. The pump began to work. The candle flickered and went out. The bell seemed to sound fainter and fainter, though the clapper kept on striking. korf shut off the pump. "Now, except for weight and heat, the same conditions prevail in this chamber as in space. Yet Mr. Suchinow, with whom we cannot communicate at present, certainly feels alright." Sam looked through the window, and laughed out loud. In fact Suchinow presented a very comical appearance. The suit had swelled to its fullest extent and had taken on the shape much like that of the favorite rubber dolls of festival times. 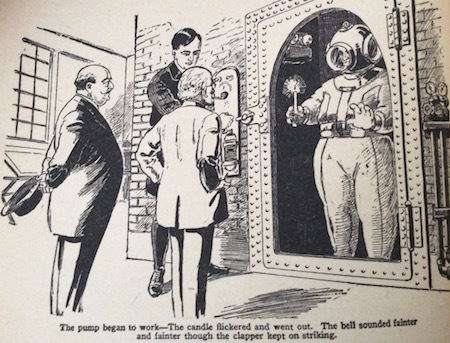 Gail refers to the suits as pneumatic suits; the phrase "space suit" was first used in 1931 by Golden Age scientifiction duo Nat Schachner and Leo Zagat (see space suit from The Emperor of the Stars). Be sure to take a look at this amazing video showing an astronaut barely surviving NASA spacesuit testing in the 1960's.